I was compensated by Med-IQ through educational grants from AbbVie, Astellas, and Genentech to write about managing distress for cancer patients and their caregivers. When my phone buzzed in my pocket, I was filing papers on a brisk January morning. I smiled when I saw my Dad’s number pop up on my screen. No matter how many times I’d tried to tell him that I couldn’t chat during my hours as an assistant school nurse, he still called during work hours. And though I always took his calls, this call was different. This call changed our lives. “So, it turns out, I might have a little bit of cancer,” he said from across the country, his attempt at humor falling flat at my feet. “I’m going to need you to be more specific,” I said, as the panic started rising in my throat. A few weeks prior, just before Christmas, my father had had a minor stroke. I had flown down in the midst of the crisis to be with him and to help coordinate his care. When I’d left a few days later, all seemed well: he would have physical therapy for the residual effects from his stroke and he had appointments scheduled to pinpoint the source or cause of the stroke. By all accounts, he was lucky. He’d dodged “the big one,” so to speak. In subsequent workups and after a battery of tests, he learned that it was a swollen lymph node pressing on an artery in his neck that caused the stroke. When my father was diagnosed with stage IV cancer, I wasn’t prepared for cancer related distress. The lymph node was part of the “little bit of cancer” now floating in his veins. And, though he tried to cushion the blow with humor, the news was devastating: my father had stage IV esophageal cancer. The rest of his call passed in a blur. My nursing brain collided with my daughter heart and I could barely see the filing cabinets in front of me as I tried to process what he was telling me. No one tells you that when you find out your father is dying, the papers you were filing fall to the floor and you stare at them blankly, wondering who will pick them up. It was during that call that cancer-related distress came to reside in our family. Not only was my father under incredible stress related to his new diagnosis, our family was suddenly gut punched by the reality of having to understand complicated medical treatments unexpectedly. Cancer-related distress is any unpleasant feeling or emotion (such as feeling sad, hopeless, powerless, uncertain, guilty, etc.) that affects a patient/caregiver’s quality of life, how they cope with cancer, and how they interact with others. It can include mental, physical, social, or spiritual suffering, and it may make it hard to deal with having cancer, its symptoms, or its treatment. Cancer-related distress slammed into our lives like the Kool Aid guy breaking through a brick wall. In an instant, my life immediately revolved around cancer. I was terrified, and I wasn’t even the one facing the terminal diagnosis. 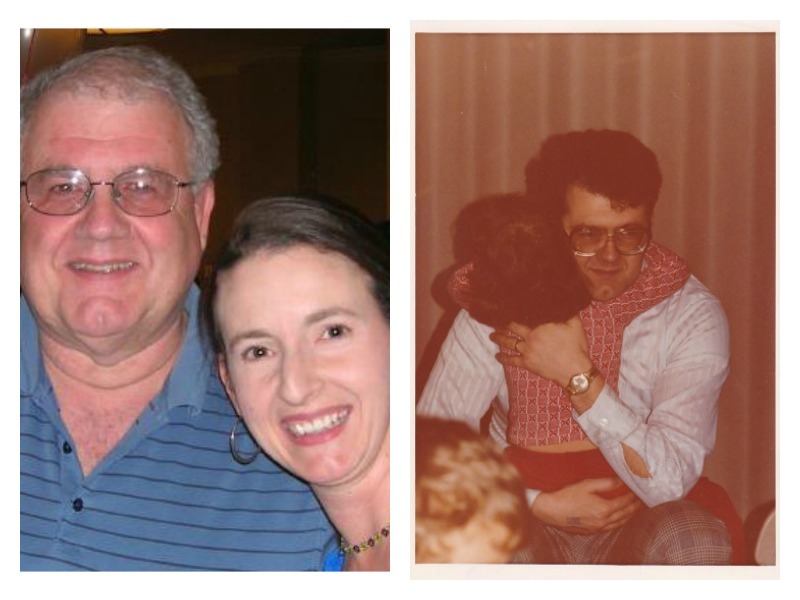 The enormity of my father’s cancer diagnosis weighed on my mind day and night. In the immediate aftermath of his call, I felt helpless because I lived clear across the country. I was angry, and for a control freak like myself, the “not knowing” part of a cancer diagnosis was unbearable. I juggled my feelings as a scared daughter with the realities I knew all too well from my days working in the ICU: stage IV cancer was damning, at best. In the weeks that followed, I found myself researching clinical trials at 2 am and crying hopelessly on the phone with my best friend. I raged at my husband and unsuspecting cashiers at the grocery store. I was so damned angry: why now? Why was cancer a part of our lives just as our kids were old enough to really bond with my father? The best years of our lives were coming, and it felt like my father was going to miss all of it. It was as though we were already grieving, and the distress I felt was insurmountable some days. And the only way I knew how to cope with it all was to lean on my nursing training and the professionals who surrounded my father. I spoke with his nurses late at night and detailed how anxious we were all feeling, particularly my father. I explained that it was in my father’s nature to be stoic, to not question medical authority, and I found myself crying as I explained that he was inwardly terrified. I prayed that the doctors and nurses around him would be able to help him find joy and comfort on the days when I couldn’t be by his side during treatments and procedures. A few months after the diagnosis, my father’s oncologist met the business end of my distress and panic over his cancer and treatment. Because I’m my father’s daughter through and through, I rounded on the unsuspecting doctor as he left my father’s room one afternoon. I poured out my anger and frustration that my father was being put through the ringer and having to endure grueling chemotherapy treatments that felt futile. “He has stage IV cancer; don’t you get that? He’s going to die and I can’t bear that he doesn’t know it.” I yelled through angry tears. The doctor patiently listened to me and, with kind eyes, let me have my tantrum in the middle of the sterile hospital hallway. I heaved angry sobs and hot tears flowed down my cheeks. As my sobs quieted, my father’s doctor said something that changed my perspective entirely. “Let me ask you something, if I may?” he asked somberly. I crossed my arms, stubbornly blew my nose into a wadded tissue and shrugged my shoulders noncommittally. “When you were on my side of the table, when you had to break a difficult diagnosis to a patient, did you march into the room and kick the chair out from under him?” he asked. I stared at him and slowly shook my head. I shook my head emphatically and the reality of what he was saying washed over me. Hope. Joy. Acceptance. That’s what my father needed right now. He needed to know that I recognized his fears but that right now, in this moment, as I was loudly blowing my nose into stale tissues, he was alive and life was good. I could still talk to my father and the cancer hadn’t yet stolen those moments from me. While I knew those moments were fleeting now, his oncologist helped me see that talking about our distress and facing it head on was going to be necessary in my Dad’s final months. And that’s just what we did, my father and I. In those final months, I learned what really brought my father joy. And he helped me prepare for life after he was gone, one step at a time. When it became clear that his cancer was terminal, though the distress was palpable some days, I reminded myself that he was still with us. “I’m not dead until I’m dead. I’m still here, sweetie,” he said to me in one of our final phone calls. And, on the day I said my final goodbye, whispered from across the country as my brother held the phone to his ear, I felt the distress dissipate. He was at peace and, for the first time since his diagnosis, so was I. Please take a moment to participate in this survey, which will take less than 15 minutes to complete. You will be entered to win one of ten $100 VISA gift cards. No personal information is kept, sold, or stored in the survey completion process. Once you have completed the survey, you’ll be given an email address to use to tell them you’ve taken the survey to be entered to win. For our 30th wedding anniversary we went to a health fair in Tampa (I know, how exciting). As we passed by the booth offering PSA tests, they tried to encourage my husband to have one. He rejected their advances, saying he had one a few month ago. As we finished looking through the other booths, we passed by this booth as we left. This time I encouraged my husband to have the test. He agreed. Within the week we received a phone call telling my husband to see his doctor immediately. As my husband shared the results of his test with his doctor his doctor said, “I though something wasn’t right, but the insurance company doesn’t like to pay for PSA tests at your age – my husband was 49. After lots of testing and procedures, we finally ended up at Moffitt Cancer Center. My husbands Gleeson score was a 10 and he was a stage D1 – they gave him about four months to live. Both of us were angry – at the doctor that didn’t do a PSA, at God – I was angry at my husband – he was suppose to put socks on my feet when I was old – we were going to sit on the porch and look at the stars. That was 22 years ago. My husband has received constant treatment from the marvelous doctors at Moffitt and is on many medications. None of his doctors are able to give us an answer as to why he has survived this long – they assure us that it goes way beyond them.